The DJI Matrice 210 has revolutionised the commercial drone market since its release, providing a robust enterprise solution at an affordable price. Situated as the middle model in the Matrice Series, the M210 benefits from a dual gimbal which enables the operator to capture two data sources at the same time. 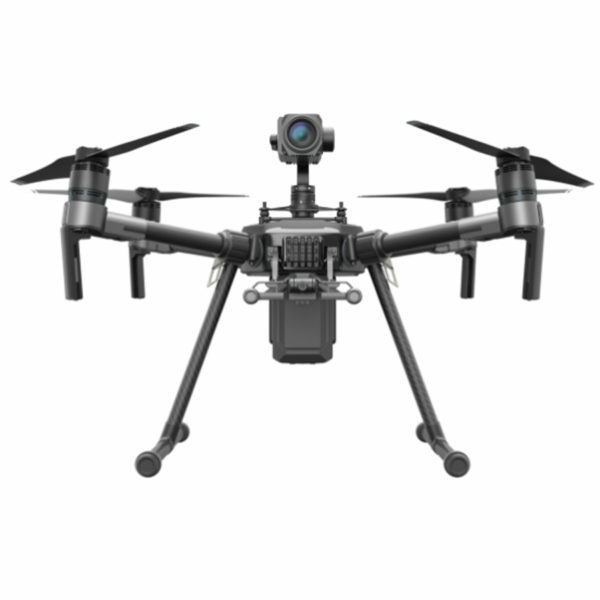 The DJI Matrice 210 price is available upon request. The DJI Matrice 210 has revolutionised the commercial drone market since its release, providing a robust enterprise solution at an affordable price. Situated as the middle model in the Matrice Series, the M210 benefits from a dual gimbal which enables the operator to capture two data sources at the same time. This is particularly useful in industries such as search & rescue or solar panel inspection where a user may require simultaneous HD imaging and thermal imaging. With the inbuilt option of an upward gimbal, the DJI Matrice 210 has revolutionised the way data is captured in a number of scenarios including bridge inspection and wind turbine inspections. COPTRZ are committed to providing you with the best possible drone solution for your business. That’s why when you purchase your M200 Series from COPTRZ you’ll also receive over £3000 worth of added extras. Find out more. What cameras and payloads is the DJI M210 compatible with? The DJI Matrice 210 currently supports the Zenmuse X4S, Zenmuse X5S, Zenmuse XT and Zenmuse Z30 cameras. What is the difference between the DJI M210 & DJI M200? The DJI M210 can mount 2 payloads and receive data simultaneously whereas the DJI M200 can only mount 1 payload at a time. It also comes with a DJI Cendence controller and CrystalSky. Is a Cendence Controller and CrystalSky included in the box? Yes, it’s supplied with a Cendence Controller and 7.85″ CrystalSky. Is the DJI M210 suitable for bridge inspections? Yes, bridge inspections are one of the key applications for the M210 due to the ability to mount a top mounted camera. I’m looking to do construction surveys and 3D mapping, do I need to upgrade to the RTK version? The RTK version is not a requirement if you intend to do 3D mapping, however you can expect more accurate readings with an RTK enabled drone. What is IP43 protection rating, and in what scenarios can the Matrice 200 series be protected under this rating? IP43 protection rating means that the Matrice 210 series can be protected from objects greater than 1 millimetre, and from water spray less than 60 degrees vertically. The IP43 protection rating can protect the Matrice 210 when used in adverse environments with dust particles or light showers. Does the DJI Matrice 210 have retractable landing gear? No, it does not have retractable landing gear. Is it possible to integrate third-party software and payloads with the M210? Yes, it comes complete with an onboard and mobile SDK for customer software and payload integration. Is a case included with my DJI M210? Yes, your M210 comes with a travel case customized to securely transport your model. The case comes with enough space to fit 6 TB50 or TB55 batteries, 2 payload containers, 2 sets of propellers, one controller, one charger and charger hub, a CrystalSky tablet or Apple iPad and a manual. I’m interested in inspecting power lines and telecom towers worried about interference affecting the safety of my inspection. Is the M210 suitable for this application? For operators that expect to experience electrical or signal interference during flight, we suggest using it alongside the Zenmuse Z30 zoom camera for optimal safety. This allows the operator to maintain a safe distance and still inspect the structure using an optical zoom camera. Can the DJI Zenmuse XT be used with the DJI Matrice 210? The Zenmuse XT camera can be used with the DJI M210 but will require a gimbal adapter and some versions of the XT camera need to be upgraded. What software is available to use with the DJI Matrice 210? Pilots can use the DJI Pilot or DJI GO 4 app. The DJI Pilot app is a new Android app for enterprise users designed to unleash the full potential of DJI’s commercial drones. Does the M210 Series support the Adobe CinemaDNG and Apple ProRes? No, it does not support these formats. It harnesses computer vision via multiple DJI sensors, allowing your drone to collect data more efficiently to aid intelligent flight modes. Spotlight – Lock onto a selected subject during flight while the aircraft continues to move freely. Point of Interest – The Point of Interest feature lets you orbit smoothly around an object or structure, ensuring your flight time is as focused as possible. A useful method for mapping a building, piece of infrastructure or other environmental feature. Tripod – When you’re navigating confined spaces, there’s no margin for error. Tripod allows you to fine-tune the positioning and angle of your M200 series drone, ensuring it’s exactly where it needs to be. ActiveTrack – Follow a person or object and keep them in the frame. This valuable tracking method allows for complex, creative tracking shots. The DJI M210 features a dual battery system to increase flight time and redundancy. Supported batteries include the DJI TB50 and DJI TB55. The M210 has a folding body which is easy to carry and set up and comes complete with a bespoke travel case to make transportation of the UAV and all its parts smooth and simple. Unlike many other industrial UAV’s, it can be set up in minutes by only a single operator. Take your data capture to the next level with dual camera compatibility. When the Matrice 210 is equipped with both an aerial zoom and thermal camera, first responders can quickly locate missing people even in the most remote areas. They can be quickly tracked, and therefore quickly located and rescued with the safest approach. The DJI M210 has improved stability in windy conditions, combined with the top mounted gimbal. This allows the M210 to inspect turbines with considerable ease and allows it to spot millimetre-sized damage along all parts of a wind turbine’s propellers. With a top mounted gimbal, pilots can fully inspect bridges, allowing teams to adequately plan maintenance schedules for improved public safety and minimised costs. It combines visual and multispectral cameras to allow for quicker crop scouting and enables farmers to analyse any areas of crop growth that may need more work than others. During wildfires and other large fires, firefighters can use both visual and thermal cameras to scout the area and assess dangerous situations. Watch the full-featured video of the DJI Matrice 210.